Nov 27 (Hindustan Times): THE XLRI, Jamshedpur, will have its presence felt during the United Nation's Conference on Financing for Development to review the implementation of the Monetory Consensus at Doha (Qatar). The conference is scheduled between November 29and December l. Professor of finance and economics at the institute, Dr H K Pradhan, has been preparing the main paper for the United Nations Economic and Social Commission for Asia and the Pacific (ESCAP), which will be presented at the international conference that assumes significance in view of the global recession. Dr Pradhan, who was associated with the Commonwealth Secretariat for two years, is the only Indian involved in the theme paper of ESCAP.He has visited 20 countries across the globe on important assignments. 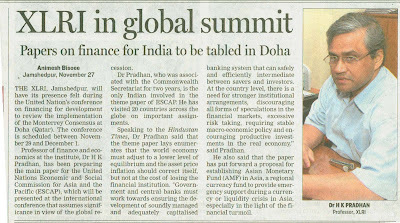 Speaking to the Hindustan Times, Dr Pradhan said that the theme paper lays enumerates that the world economy must adjust to a lower level of equilibrium and the asset price inflation should correct itself, but not at the cost of losing the financial institution. "Government and central banks must work towards ensuring the development of soundly managed and adequately capitalised banking system that can safely and efficiently intermediate between savers and investors.At the country level, there is a need for stronger institutional arrangements, discouraging all forms of speculations in the financial markets, excessive risk taking, requiring stable macro-economic policy and encouraging productive investments in the real economy," said Pradhan. He also said that the paper has put forward a proposal for establishing Asian Monetary Fund (AMF) in Asia, a regional currency fund to provide emergency support during a currency for liquidity crisis in Asia, especially in the light of the financial turmoil.